- 殘編 (Tanya Hsu) on 十一月 21, 2018. Where can one find a real sushi restaurant in Taipei? If chains like Sushi Express or Kura Sushi are what come to your mind, please skip this post, we don’t speak the same language. The décor reminds me of the traditional Japanese sushi bars I’ve been to in Japan walking in. a beautiful stone path in the front yard led us to the door with a “2018 Michelin Guide” sticker on it. The door opens at 6:00pm. The sushi bar seats fifteen only but there are four chefs standing by. My hobbit legs don’t stop me from jumping up to the high chair with excitement, of the $3000, $4000, and $5000 options, we choose the $3000. It’s my first time having real sushi in Taipei, better start from the beginning. After being seated, our chef gave us an appetizing dish with pickled radish, cucumber, and ginger. There is also a small plate of fruit vinegar sprinkled with either chives or green onions, which is used for sushi later. After being seated “properly,” the chef serves us freshly ground wasabi from Alishan, then the knife actions begin. Our first dish is a slightly sweet appetizer with white fungus, mushrooms and asparagus mixed with sesame vinegar. Our chef is Chef Awei. His full attention on making our sushi added charisma to the dinner. Then comes the sashimi. 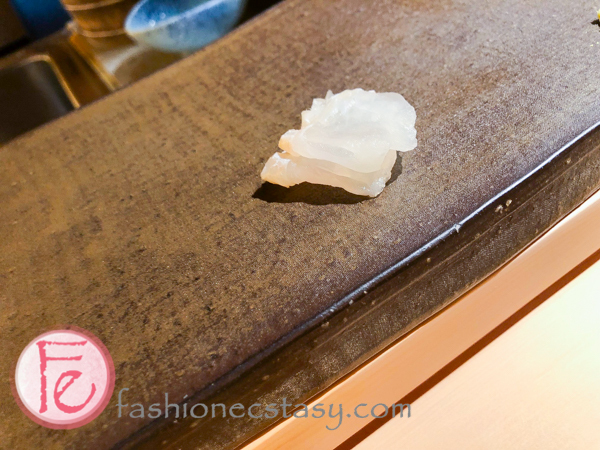 For starter, Awei used a bigger knife to slice thin pieces of konbu (kelp) marinated flounder sashimi, then a smaller blade to cut the details. 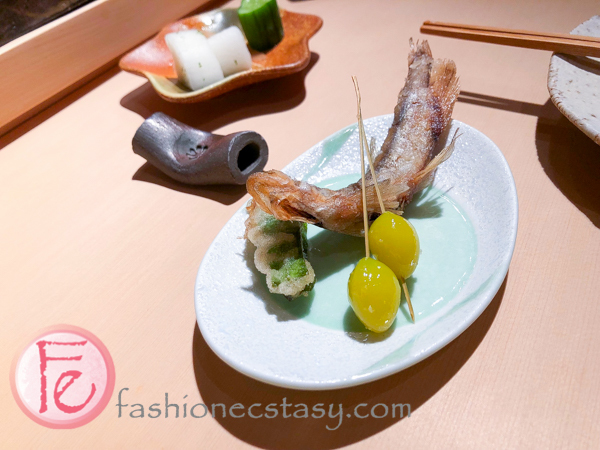 This dish is eaten with the fruit vinegar provided and without wasabi. 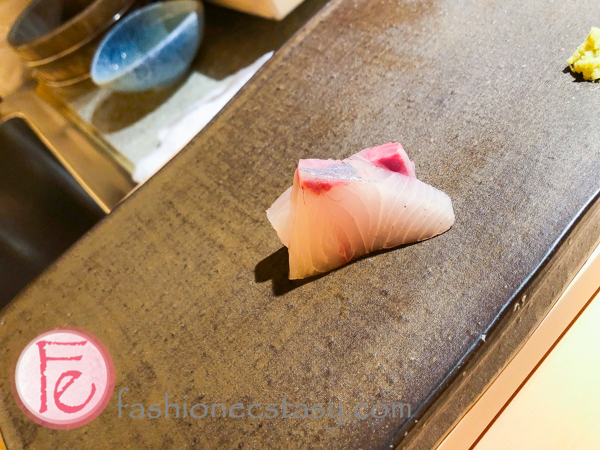 Japanese wild kanpachi sashimi is served in thicker slices, the texture is smooth and has no fishy taste. Chef Awei cuts out the details so fast and precisely. We had to ask if Eating fish and consuming DHA on a daily basis really helps with his superb eyesight, because if that’s is the case, us smartphone adddicts must get our DHA fix today. Chef Awei said humbly that he “feels” it, not “sees” it. Bonito tataki has a darker colour. 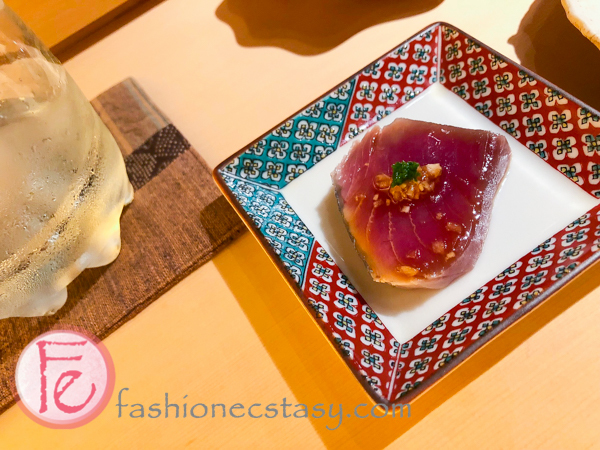 “Tataki is a cooking method in Japan that smokes fish in wheat straw, giving it a stronger taste,” said Awei. Awei brushes a layer of citrus-based “ponzu”sauce that is made with orange vinegar mixed with sashimi soy sauce, then tops the sashimi with onions, ginger and garlic. The gingko is hot and delicious when served. They recommend eating ginkgo first, then the fish, and finally the wing beans. The service was thoughtful and they change our plates after every dish. Because sushi (eaten by hand) courses are following shortly, rising hand towels are served prior to the next dish. Aori Ika is bigfin reef squid with a half-transparent appearance. Its springiness (QQ: a new term invented by our people!) makes it one of my favorite sushi since always. The fish itself is light in color and has no fishy taste. Chef Awei adds soy sauce powder to add taste. Sasa buys raw materials (red beans, wheat and yeast) from an old known soy sauce shop in Hyogo Prefecture, Japan, then dry and ground into powder. Giving the powder a yeasty and soybean taste. Chef Awei used the skillfully separates the flesh and skin of the next fish in just a few seconds . We couldn’t help but ask if he acquired his skill from a master “shifu” in Japan. He tells us his former mentor was a master of the best-known Tsukiji fish market in Tokyo. It all makes sense! This sushi is exceptionally large. Chef Awei peels the skin skillfully with a knife, then cuts out fine details, then separated the fish in half to place green onion with ginger juice in, adding a nice touch of color. The fish itself has a glossy texture and perfect for photos. Sea urchin sushi is not just a stingy piece of sea urchin, but Chef Awei takes two or three pieces of Yamata sea urchin from the boxand wraps the sushi in seaweed (watch the video above). 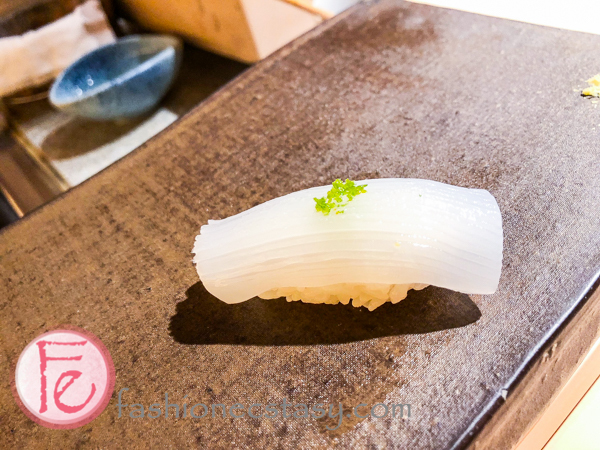 This sushi is made with two layers of toro’s jaw sashimi. The texture is moremarbled and delicate and more fragrant than the regular toro. Anago is a saltwater eel. 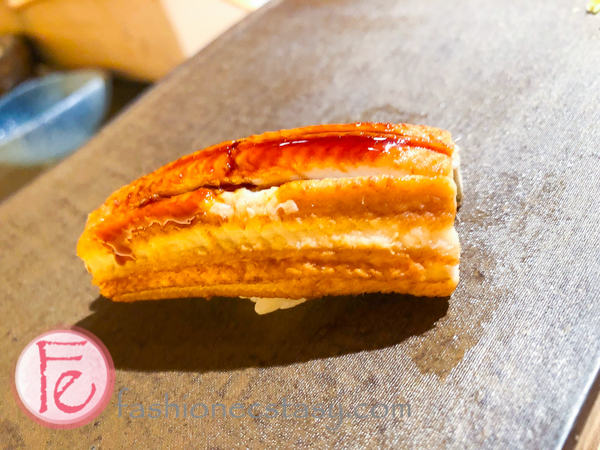 It is different from the usual freshwater unagi (うなぎ) that is commonly eaten in Japanese restaurants.it has a finer texture with less fishy taste. 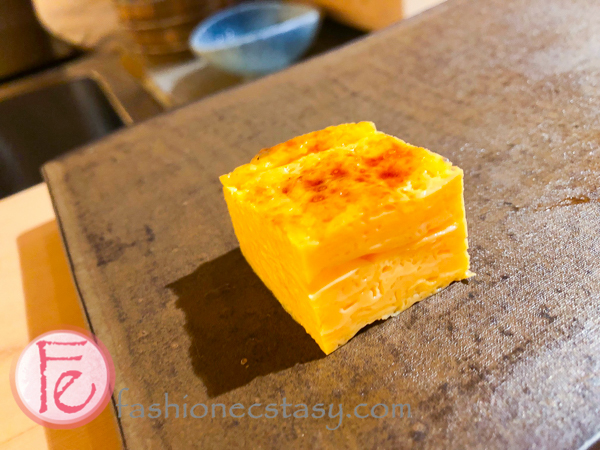 Then comes the popular egg sushi (tamagoyaki) that tempts to bring us into dessert mode. 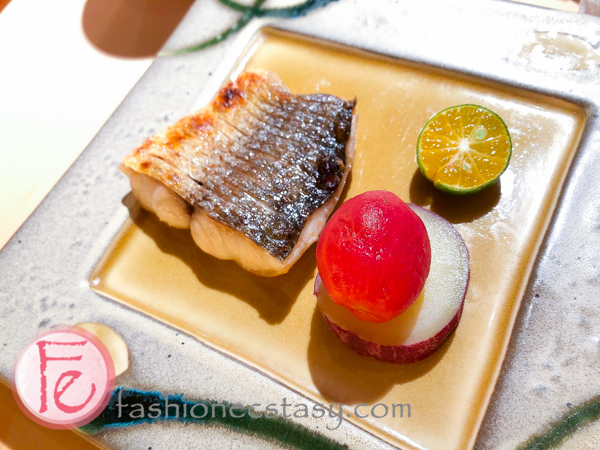 grilled food: delicate threadfin fish is paired with sweet and sour plum tomatoes, and a piece of chestnut sweet potatoe that not only taste like chesnut but also has a chesnut texture. as we approach the end of the meal, our server serves a heart-warming miso soup with tofu skin from Kyoto (watch the video above). 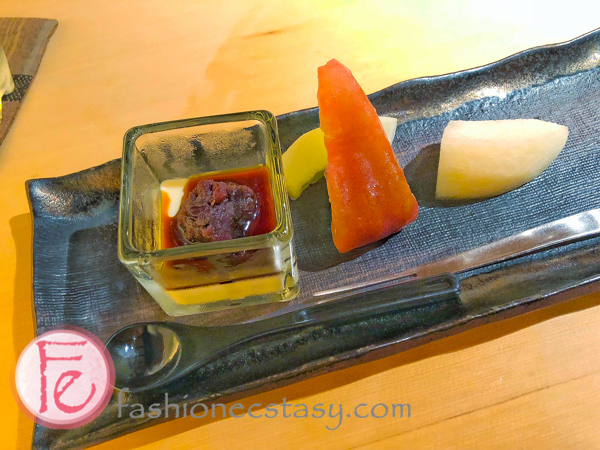 dessert is soy milk tofu with fruits: a piece of wax apple, Chinese pear and muskmelon each which is a perfect non–diabetic ending for our meal. 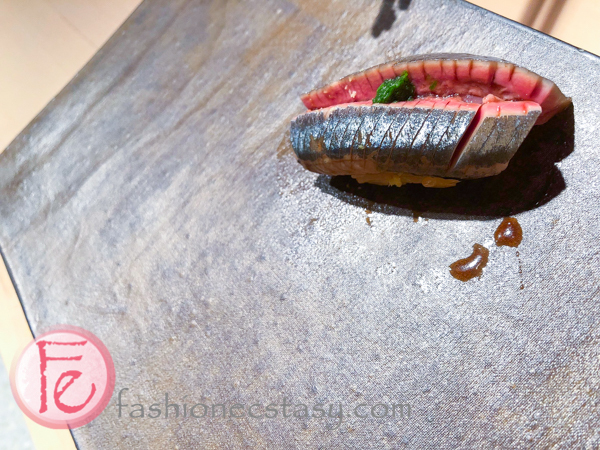 Sasa Japanese Restaurant & sushi bar is conveniently located at Zhongshan Station, Taipei. The size of their sushi is larger than usual. The sushi chef has an extensive knowledge base of sushi. We learned a lot from him. This meal not only feeds you high-quality sushi, but also feds you knowledge from sushi experts. It’s a feast for both the eyes and stomach.